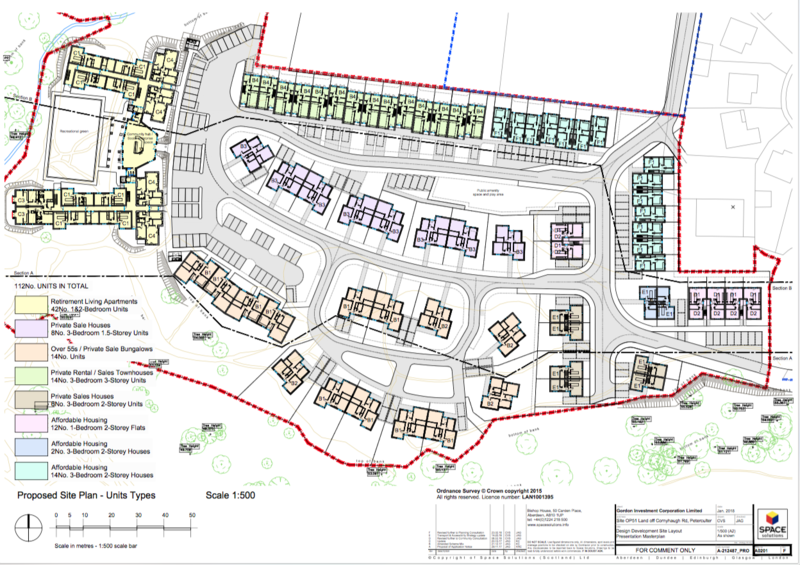 The formal planning application for a housing development on site OP51 off Cornyhaugh Road and the Shoddy is now open for us all to comment upon. This will be for a residential development including a mix of private, affordable and retirement housing consisting of approximately 112 homes with associated access roads and landscaping. The application number is 180262. Full details of the application together with all the documents relating to the application can be viewed on the Aberdeen City Council website – click the links below. Comments must be received by Planning by 22 March. Please note: the feedback so many of you provided at the exhibition does not form part of the formal review of the full application; you need to write to Planning, making either the same points as before, or different comments if your views have changed in light of the revised scheme. What is the scheme now proposed? There are now 112 homes in total rather than 142; the retirement flats are now at the western side of the site; and the majority of the other homes are 3-bedroom houses. See the proposed layout below. The buildings are now a maximum of two-and-a-half storey above the main site. The retirement flats take advantage of the drop in levels to the west to accommodate more storeys whilst keeping the roof-line at two storeys seen from the main part of the site. See “Site Sections” below. Road access to the site is to be via the Shoddy, made up to proper standard with a pavement, and with a pedestrian and cycling route along from Cornyhaugh Road which also allows emergency-services access. The scheme is on a site designated for residential development in the Local Development Plan (LDP). The LDP provides for 19 homes on the site, although that number falls foul of current Council policy which requires at least 30 homes per hectare – a figure the scheme meets. How does this fit with the thoughts and concerns we have heard? 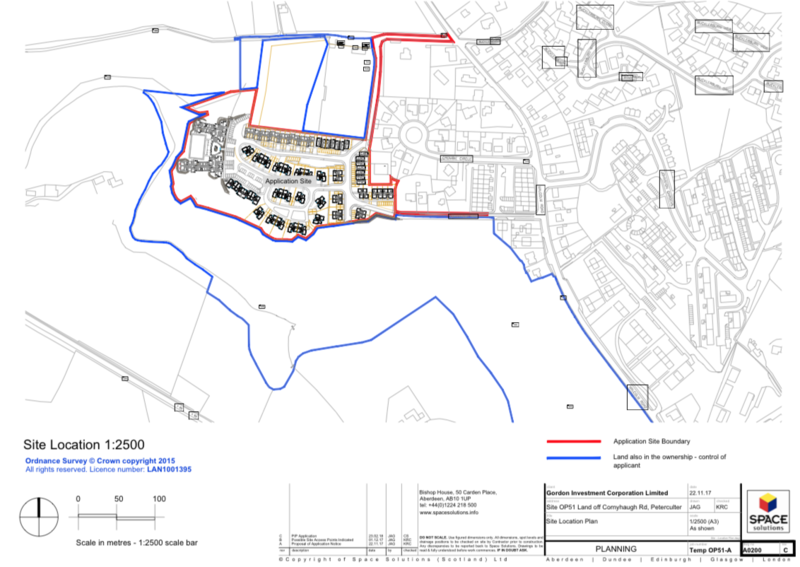 Use of the site – this site is zoned for residential development, so the authorities will be inclined to approve some form of development, rather than leaving the site as waste ground – which some of you feel is a mess, and some like as it is because it is green. Many of you have told us over the years, and at the Gala, and after the public exhibition, that Culter needs new homes for growing families. 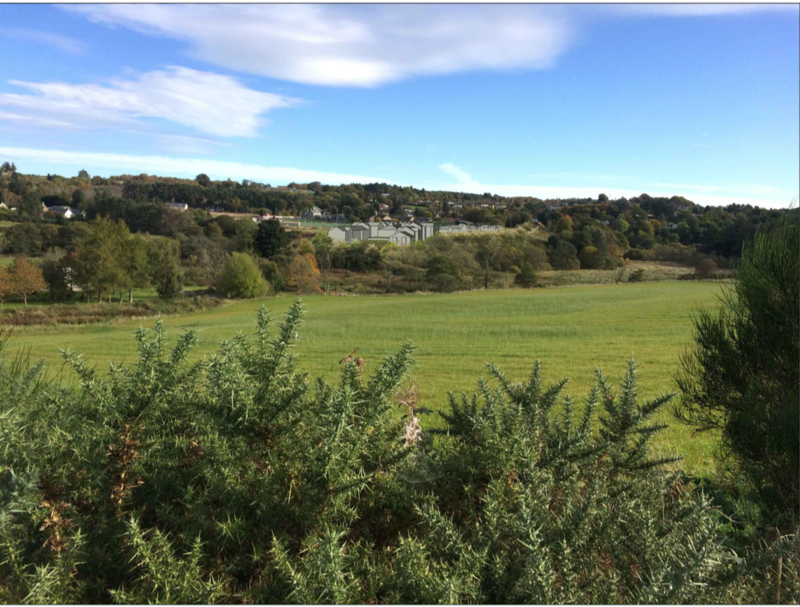 This is the only site in Culter with room for more than 8 houses, so if we reject this or similar proposals, we force our young families to move to Milltimber or Cults – if they can afford it – or move much further away. The other side of this question is that no-one likes having new development next door, and a number of our community will be affected by this proposal. How does the impact on neighbours balance with this sole opportunity to provide more homes in the village for our growing families? 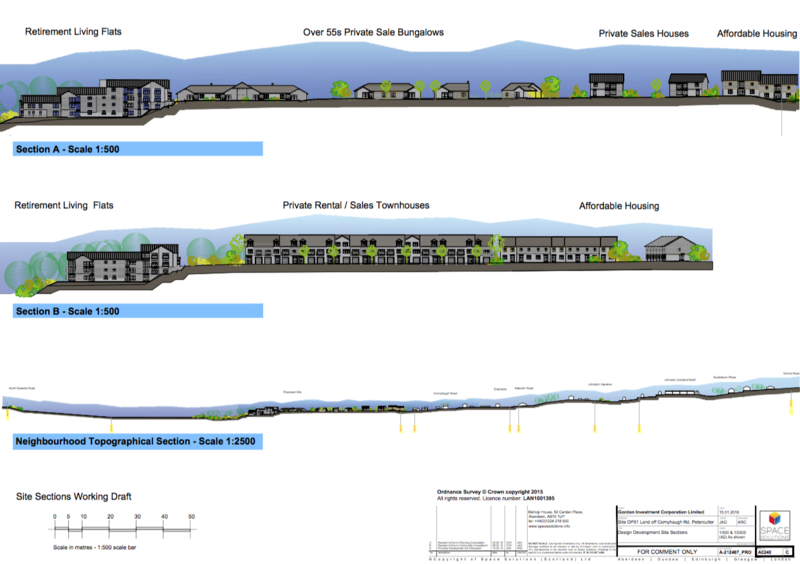 Design of the proposal – the proposal is for 112 homes, consisting of 42 retirement flats and 14 bungalows for over-55s (both of which types could tempt Culter residents who like the idea of moving somewhere smaller and modern, thereby freeing up houses elsewhere in the village), plus 44 3-bedroom houses (a mix of 2-storey, townhouse and Affordable) and 12 Affordable flats. Some of you expressed concerns at the public exhibition about the height of the buildings. They are now two-and-a-half storey or less, and the majority are arranged to take advantage of light from the south. Some of you wanted to see a smaller development; this is now 112 homes, and almost at the minimum required by planning policy (which is to avoid sprawl and reduce travel distances). If planning permission is granted, then any subsequent attempt to increase numbers of homes would require a new planning application. Do we support this scheme for providing a mix of new homes suitable for growing families and for retired folk, or object to it and await a proposal of 5-bedroom detached houses or 2-bedroom, 2-bathroom flats? Environmental impacts – the applicant has shown awareness of the environmental quality of the Culter Burn (Leuchar Burn) area, and has proposed measures to limit the impacts both during construction, and from the final scheme which leaves the lower shelves largely untouched and is to have lighting designed to minimise light spillage into those areas. New soil is proposed for the gardens. Are the proposed measures together with appropriate enforcement appropriate, or are there other measures you want to see taken? Access and roads – the scheme is to have a properly-built road and pavement in from the Shoddy, and pedestrian, cycle and emergency-vehicle access along to Cornyhaugh Road. The junction design from the Shoddy onto Malcolm Road complies with the usual codes, and Roads department appear to be comfortable. Transport Scotland tells us AWPR will reduce traffic on Malcolm Road by over 90%. Including the traffic from this scheme, Malcolm Road will still be far-quieter than today even if the Transport Scotland estimate proves optimistic. Are the proposals for access and roads sufficient, or are there other measures you want to see taken? Local and village facilities – the scheme provides lots of gardens, and a reasonable amount of public open space within the scheme, and is to include improved access to the wilder areas around the housing. The proposal sets out an arrangement with Culter Youth Football Club to support their relocation to a site where they can have an all-weather pitch. Occupants will add to the school roll, and more-so to the calls upon the health centre – the scheme will add about 5% to the number of homes already in Culter. Does anything need to be done to enable the school and the health centre to adjust to 5% more attendees over the next 5 years or so? Please write to Planning (details on how to do this below), whether you approve of the scheme, hate it, or think it would be just about acceptable provided X or Y were changed. It will be very helpful to the Community Council in representing the views of you the community if you would also copy us your response – but if you only do one thing, respond to Planning by 22 March! Telephone 01224 523470 or look up https://www.aberdeencity.gov.uk/services/planning-and-building/planning-applications/comment-planning-application#1783 for help on the mechanics of making your comment.